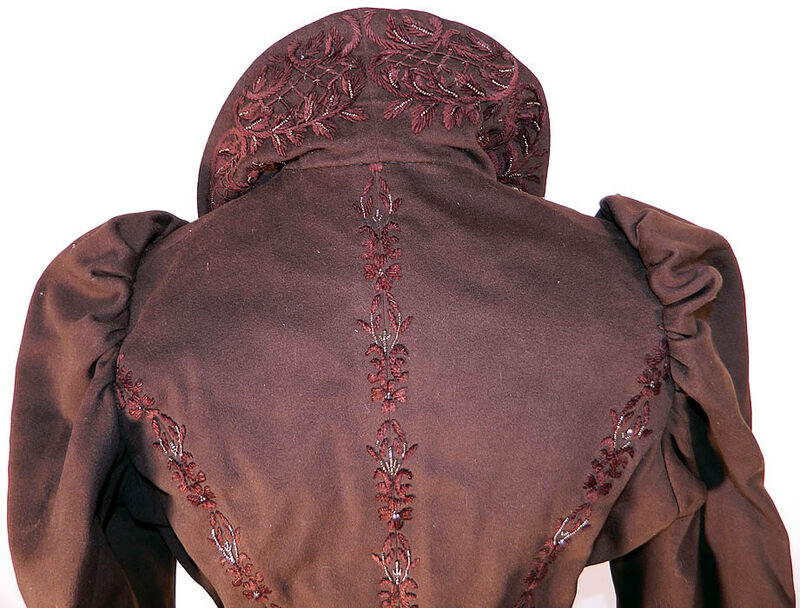 This amazing antique Victorian era Hirsch & Co Brussels beaded brown wool embroidered bustle gown dates from the late 1880s. 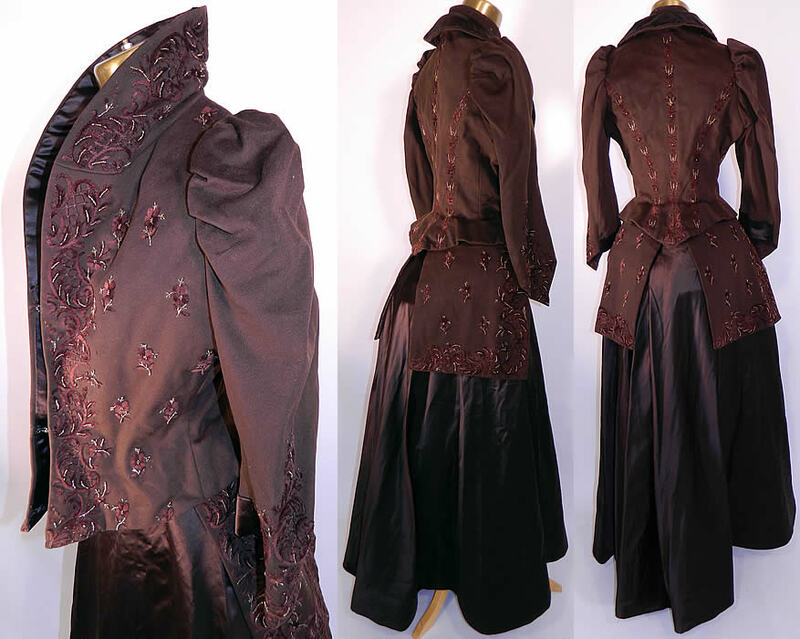 It is made of a dark chocolate brown wool and silk satin fabric, with steel cut beading and brown silk raised padded satin stitch embroidery work done in a floral vine leaf design pattern. This gorgeous gown 3 piece travel visiting dress has a fitted bodice jacket, with vest style insert which has a high neck collar, wide silk lapel, gathered shoulders, long tapered sleeves which come to a point at the cuff, a peplum skirted waist and hook closure front. 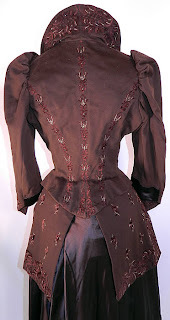 The bodice measures 21 inches long, with a 24 inch waist, 34 inch bust and 11 1/2 inch back and 21 inch long sleeves. There is a long floor length full skirt, with slight bustle back and hook closure. The skirt measures 41 inches long, with 38 inch hips and a 24 inch waist. There is also a matching fabric embroidered beaded apron skirt panel. 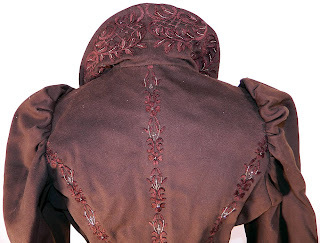 The overskirt measures 13 1/2 inches long, with a 24 inch waist. All three pieces are quality made, fully lined and the bodice has a "Hirsch et Cie Brussels" luxury department store haute couture label sewn inside which was dressmaker to the Queen. 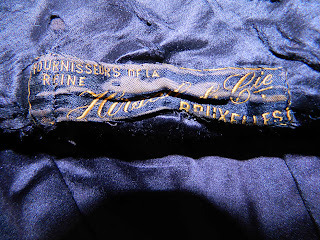 It is in good condition, with only a tiny moth nip hole on the front bodice and a few loose missing beads. 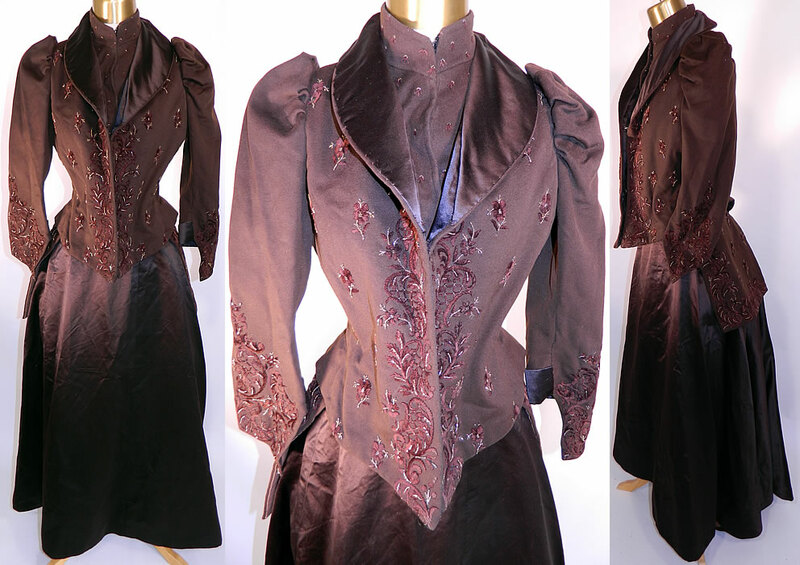 This is truly a rare and wonderful piece of antique Victoriana wearable art! You can see a similar sleeve style and even the way the "skirt" of the jacket lays in this fashion plate from 1891.